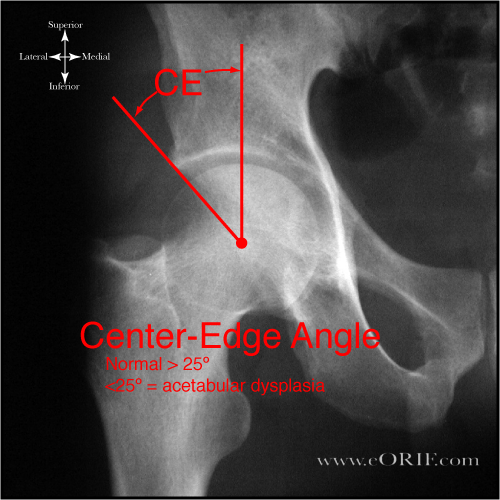 Acetabular index/Tönnis angle should be less than 10°. Crowe Classification: Type I = <50% subluxation, Type II = 50%-75% subluxation, Type III = 75%-100% subluxation, Type IV = 100% subluxation. (Crowe JF, JBJS 1979;61A:15). Periacetabular Osteotomy (Troelson A, JBJS 2009;91:2169). 81% survivorship at 9.2 years. THA with subtrochanteric Osteotomy indicated for Crowe Type IV dysplasia. (Krych AJ, JBJS 2009;91A:2213).